1. 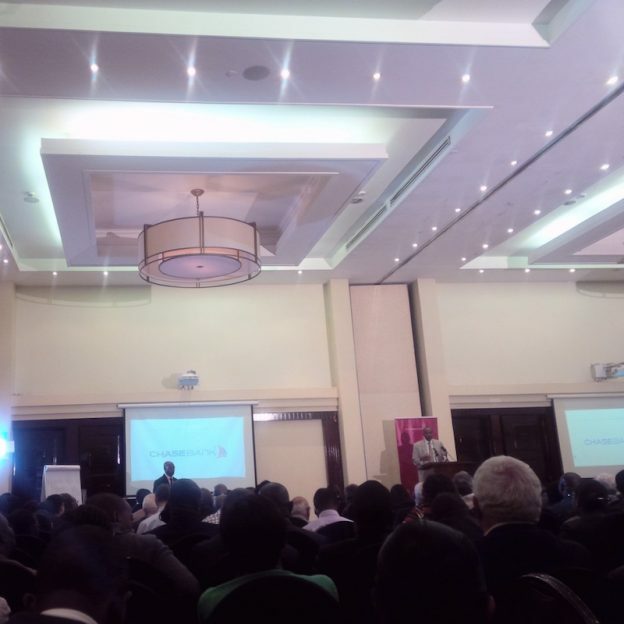 The shutdown of Chase Bank in April 2016 came after a 24-hour period that started with a second set of 2014 financial accounts published in unclear circumstances in a newspaper, with different figures. Whether this was due to a reclassification of Shariah loans or (insider) director lending was never explained, but it accelerated an ongoing run of withdrawals and the Central Bank had to close the bank the next day. While it reopened a few weeks later with funding from the central bank (channeled through KCB), and depositors have been able to access some of their funds, the bank is not back to its full standing (it’s till not lending in full, and there’s a moratorium on depositors interest) and new investors are being sought to enable the bank to stand on its own from April 2017. 2 Njomo Bill: In a rare bi-partisan move, usually reserved for their own salary raises, members of parliament rallied around to take on an even less popular target – that of super profit making, high-interest rate, banks with the Njomo bill. This was the latest attempt to rein in interest rates and the president surprisingly signed the bill, passing on a hot potato which was expected to lead to a slowdown in lending and make banks less attractive to investors. 3. Governor Patrick Njoroge at the Central Bank. Widely admired by the public for his no-nonsense enforcement & understanding of rules, supervision, austerity, and honestly to clean up the banking sector, but vilified in some circles for his unreasonable decision-making that has seen three banks close under his watch. 4. 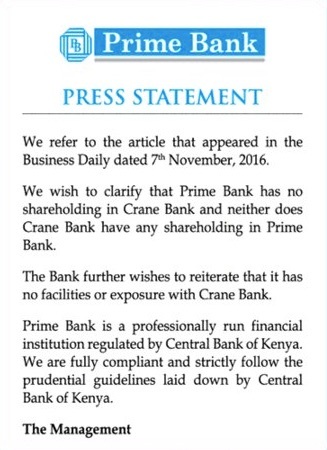 Last year Imperial Bank closure was a shock, and in 2016 the extent of the shell is still becoming clear through numerous court documents pitting the receivers, regulators, shareholders, some customers and even the family of the later managing director who engineered the fraud. But all that pained depositors want to know is, where is the money, how much money is there, and when will they get paid? 5. Lax government banking. From not following up whistleblowers on Family, Chase and Imperial, to a reluctance to act on South Sudan leaders. From double payments to government contractors, to county and national governments having dozens of banks accounts for inexplicable reasons. 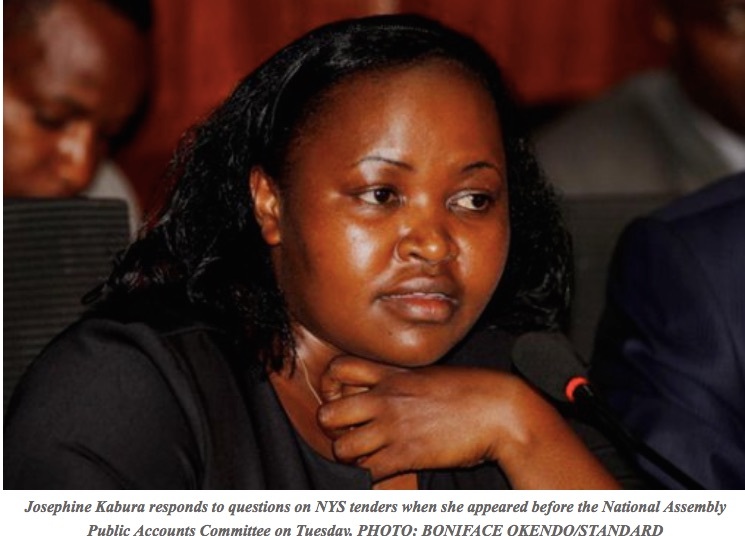 From a parastatal moving to a single signatory and withdrawing all its’ funds to pay a fictitious contract, and the funny banking of NYS money by Josephine Kabura at Family Bank. The anti-fraud / anti-money laundering/ anti-terror rules are not being observed. 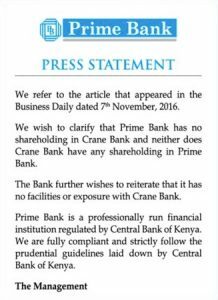 This entry was posted in CBK, Chase Bank, Family Finance, Imperial Bank, Investing in Kenya, shariah banking and tagged kenya on December 24, 2016 by bankelele. A couple of banks are in the news and are trying to put back some bad news. Family Bank (No. 14 by assets) had been mentioned adversely at parliamentary hearing s over the manner in which they handled accounts through which money fro m the National Youth Service was withdrawn. Related to that have been stories that the Central Bank of Kenya has recommended prosecution of several bank staff who oversaw these accounts. The bank has put out a vague statement on Facebook responding to the allegations and highlighting its strengths and management. Another bank, Prime Bank (No. 18 by assets) is in the news after its Chairman was reported to be the second largest shareholder of Crane Bank in Uganda which was taken over last month The Bank first put out a statement noting that it has no links, facilities or exposure with Crane Bank in Uganda. There have since been more social media messages (WhatsApp and Twitter) including one claiming that some prominent customers had withdrawn cash from the bank in panic. 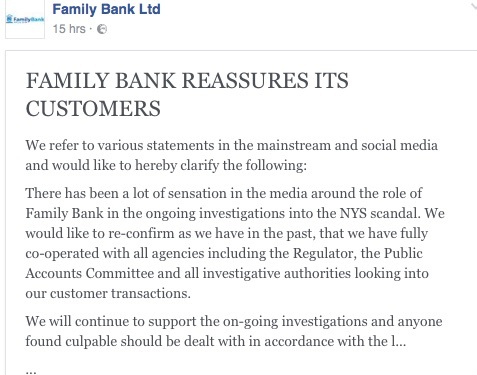 The bank has now put out a second statement clarifying that the people named as large depositors are in fact not customers at their bank and that they have lodged complaint with the Central Bank and CID, asking them to investigate the source of the rumours. Its’ difficult for banks to respond to such rumours, but they have to considering they can have an impact on liquify at the bank, even if they are not factual. The communication does not have to be online, but through reassurance to key depositors, customers and the regulators. This entry was posted in CBK, Family Finance, Prime Bank and tagged bankrun on November 14, 2016 by bankelele. I am a Blackberry (BB) user. It’s been a struggle to keep up with the world as not many new apps are being created or updated for Blackberry. While the number of BB users has flat-lined, many remain loyal and tied to their devices. Chase Bank (Mfukoni): Chase customers always rave about Mfukoni online. But starting the BB10 app starts with a somewhat sinister request for loads of data, even to open and run the app. This includes a request to connect with, and invite other BBM users, location data, shared files, calendar contacts, camera, SMS, email & PIN messages etc. If you decline, you can’t do things like search for branches or ATM’s without enabling location settings. Once connected, It seems you can open accounts, view products (youth current, women accounts, etc), request insurance, and ATM cards. But it has a few dead menus too. Co-Op (MCo-Op Cash): From the start, you can log in or do self-registration. You really can’t browse the products, or see how rich the app experience is for customers until you first register. But this is an easy process, that does not require much information – just your name, telephone number, national ID number, birth date, and your existing account number (if you’re already a Co-op customer). Family Bank (Pesapap): The app also starts with a request for lots of information like the Mfukoni one. So, once again, it wants to access your camera, device information, location data, microphone, text. email & PIN messages, calendar, and contacts. Later, you can log-in, request for cards, get locations of branches & ATM’s, but while it only took a few MB to install, it sometimes kicks you out, with a warning that your phone needs more memory. Sidian (Vibe): It’s nimble, light, and not intrusive, with good navigation and responses. It has a menu that you can jump back to, sending you back to the main menu if you cancel (e.g if you’re checking out a service that requires you be registered / or you don’t have an account). Self-registration, and signing in is simple, and you only have to enter you user name (usually your mobile phone number) and a PIN. 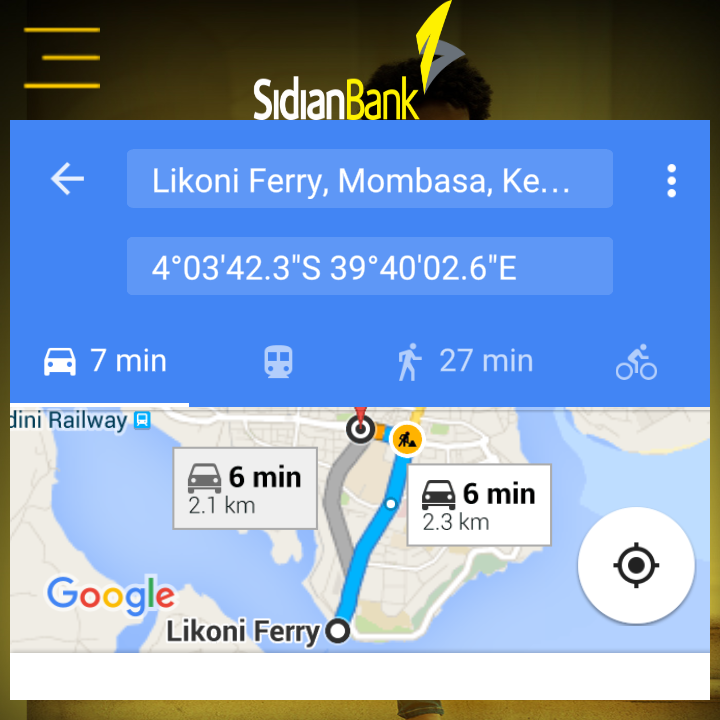 Even from the outside, you get to see a lot of what account holders can do – merchants, ticket sasa, you can search for branches and ATM’s , and they show up on a map, after which you can enter a starting point (in lieu of it pulling your phone location data) and it will give you driving directions, and even traffic information enroute, (Google has activated for Nairobi). It has the crucial m-pesa link (bank account to m-pesa, and m-pesa to bank account) and if you click to contact the bank, one click starts a call to the bank, or creates an email message to the bank. Bank of Africa (BMobile): Also asks for the voluminous info as some of the other apps, but you can bypass that request. Once you get to the products, the navigation is not very good as the menus are limited, but if you get stuck there’s a home button which takes you right back to the start. It also has a few dead menus like the debit and credit card types. This entry was posted in Bank of Africa, Chase Bank, Co-op, Family Finance, Sidian, SME solutions on May 7, 2016 by bankelele.